When you're helping clients to stop smoking, you will no doubt want an effective approach that will put them off cigarettes immediately and we have a large selection of different scripts to help with this issue. 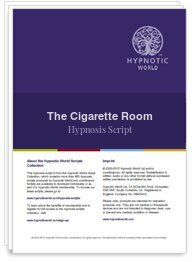 This Cigarette Room hypnosis script download has a slightly different slant to some of the others, as it begins with a beautifully relaxing riverbank induction (very suitable for those who enjoy river-fishing) and a deepener that will help your client achieve a suitable level of trance. However, the suggestions that follow use an aversive technique which, due to the element of surprise, are designed to have an immediate and lasting effect on the subconscious mind, helping clients to lose any desire for smoking.